GPT Waste Management independent waste management solutions provider services clients across the UK. They employ over 400 service providers to deliver a fully compliant service for all trade, commercial, confidential, hazardous, healthcare and construction waste, providing their client with a specific focused efficiencies. Rapid growth meant that GPT had out grown their Excel spreadsheets. Import of existing data, resulted in minimal down time on switchover. Application of Complex Pricing Models - for example Fixed price to include 3 tonnes, thereafter rate per tonne. 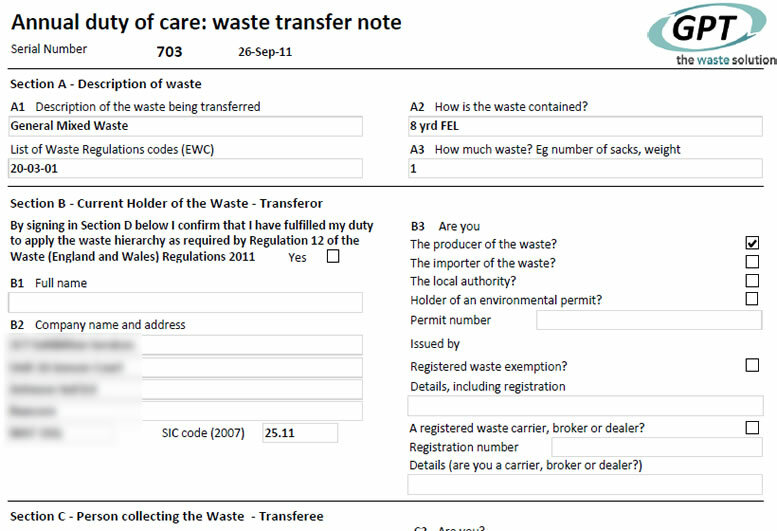 Integrated "duty of care" or "chain of custody" and environment agency reporting. See Fig 3 below. Production of client and supplier confirmation, using standard templates. Invoices automatically populated into Sage	Line50. Generation of Estimates and Quotes with multiple costing from differnt suppliers, which auomaticall can be converted to live jobs when accepted. Reduced administrative effort and reduced opportunity for error in creating regulatory paperwork and reports. For example, approval required for jobs below certain margin, confirmation can't be sent without approval. Role Based Security - defines which functions each user has perform. Efficient Scalable Database - using SQL server allows secure storage, full shared access, and fast data retrieval. Client Reporting - ability to export to excel, see Fig 2 below. Powerful Adhoc reporting allows combination of criteria to applied for example margin, client, date, created by, See Fig 1. "The most important difference it has made is that there is far more automation of processes. We also hold much better data which we can access more easily, so we can give better customer service. We can also report quickly and accurately on the services provided"
"After many years of searching for a software system, GPT Waste Management Ltd approached Paul Stanley to develop a bespoke software system that suited the needs of our business. Through out this process Paul showed us his full support and commitment to the project by, gaining a comprehensive in depth understanding of our business model and day to day activities. This resulted in a unique program to our industry, allowing it to grow with our business. Paul Stanley continues to support GPT into the next stages of the development."